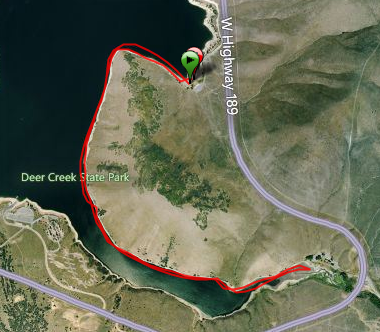 Enjoying a relaxing birthday swim at Deer Creek Reservoir. Today was my birthday and I celebrated by going for a swim at Deer Creek. My wife was kind enough to keep the boys busy at the beach while I was out. My plan was to start at Rainbow Bay, swim to the end of Walsburg Bay, and back. According to Google Maps it looked like it would be about 5 miles. I loaded up my Safe Swimmer and gave my wife a kiss before getting in the water. It was a little chilly outside, but the water was very warm. I didn't take an official temperature, but I'm sure it was at least 70 degrees. I had all of this stuff in my Safe Swimmer and still had room to spare. I took it out pretty easy and relaxed. I am out of the anti-inflammatories that my doctor gave me and I wasn't sure how my tendonitis (or whatever it is) was going to be. I had my Safe Swimmer packed with shoes, shirt, shorts, two water bottles and a camera (with room to spare). I stopped about every 30 to 45 minutes to get a drink and take some pictures. I was feeling great and was thinking about going further than planned by swimming past Rainbow Bay to the boat ramp at Deer Creek Island Resort. With about a mile to go to Rainbow Bay, I started feeling the tendonitis pain and decided it would be better to call it a day rather than risk making it worse. I ended up at 4.79 miles. GPS map of my swim from Rainbow Bay to the end of Walsburg Bay and back. Sabrina and the boys were on the beach waiting for me and cheered when they saw me. I'm lucky to have such a supportive family! As we drove back toward Heber, I was looking at the lake between Rainbow Bay and Deer Creek Island Resort and wished that I would have just gone for the extra 2 miles. We continued the celebration by going to one of my favorite restaurants, Tarahumara, in Midway with my parents, Jake, my sister and nephew. I had the lamb barbacoa burritos, a salad with passion fruit dressing and a coconut flan. If you are ever in Midway you need to go to Tarahumara. All in all, it was a really enjoyable day. I think I am going to try to get in and see my doctor again and see if there is anything else we can do. I've been trying to figure out what to do about Deer Creek this year. I haven't been able to train for the 10 mile like I wanted to because of the tendonitis. After today's swim, I think I will be entering the 10K again. Hope everyone had a great Pioneer Day today! Nice swim and happy birthday. Where did you get that swim bag and how much did it cost? There are two sizes of the Safe Swimmer. The one I have is the large size, but there is one that is a little smaller. The large one sells for $40 and the small for $35. You can buy one directly from me and pick it up at our of our group swims or I could deliver it to you.